Video games technology experts from across the world will travel to Abertay University in Dundee for this year’s Game-On 2018 international conference. Exploring all aspects of how technology is used in the industry, a stellar line-up of speakers has been included for the Dundee event, with delegates coming to the city from countries including Russia, Spain, Netherlands, Italy, USA, Czech Republic, UAE, Portugal, Finland, Japan and Australia. The conference follows the announcement of new multi-million pound Innovation for Games and Media Enterprise (InGAME) project, which will be based in Dundee and led by Abertay, providing research and development opportunities for UK studios. Artificial intelligence, security in online gaming and games for health and education, are some of the key themes on the agenda for Game-On 2018, which runs from September 18 to 20. Keynote speakers will address delegates, including Mike Cook of the University of Falmouth; Alan Hinchcliffe of Character Engine and Professor Joseph DeLappe of Abertay University. Sessions will be held on Artificial Intelligence, Game Development Methodology, Procedural Game Generation and Mechanics, Augmented Play Environments, Mobile Gaming, Online Gaming and Serious Gaming, with a Virtual Reality workshop and postgraduate project exhibition also on offer. The conference aims to share knowledge in the programming community and steer young people into the industry, while giving companies the opportunity to seek out new talent . 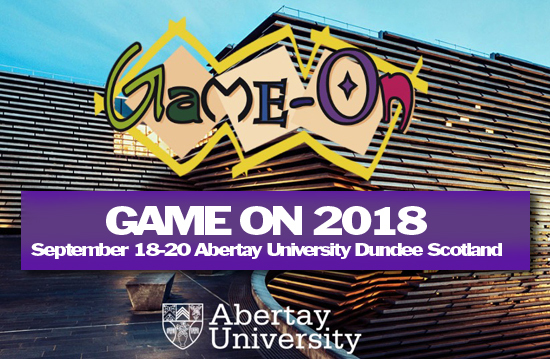 Abertay academic Dr Dave King, co-organiser of Game-On 2018 said: “Our list of speakers offers a great range and depth this year, covering everything from creative AI to political activism in games. Abertay University is ranked number one in Europe for undergraduate computer games education and within the top dozen in the world at postgraduate level (Princeton Review).